After a pretty crappy week with too much emotion to contain, I’m back on the Write Track. The monthly trip to my Writers’ Group meeting, the excitement of planning our Writing Retreat in May, the sharing of our affirmation collages and having lunch and socialising with writers has helped restore my writing mojo and my positivity. I have a lot to think about though. Our President is stepping down at the next AGM and has suggested that a whole new committee could be a good thing. She’s probably right. I’ve been doing the committee stuff with this group for 10 years now. It’s time for a break and to focus on getting an agent and on RWA. There were some great collages but what I found interesting that the people in the group who profess to be visual artists (and I don’t know because I’ve never seen any of their visual work) struggled the most with the homework and if they did it, they presented stuff that was basically just textual. 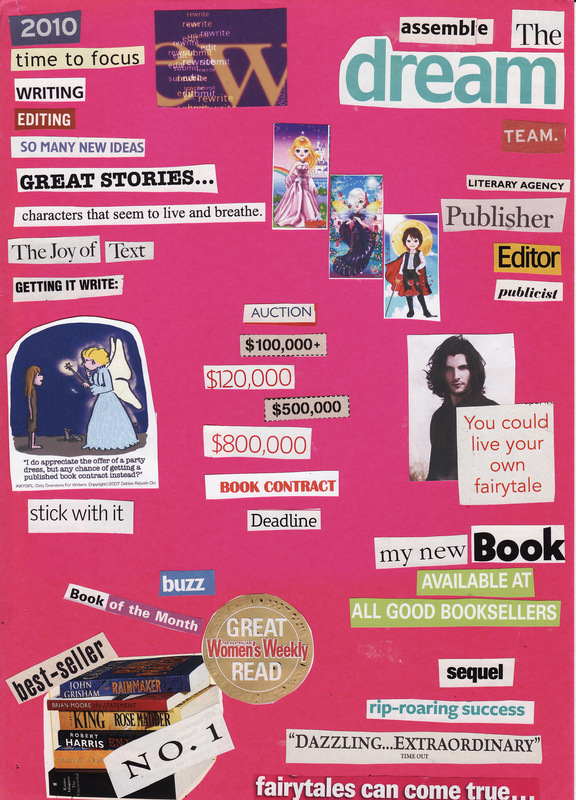 Some claimed it was too personal an exercise — which is perhaps the case, but I focused entirely in my collage on just one aspect of my life, and that was my writing. I loved Maggie’s collage. She did hers in a tiny little notebook with words/phrases/affirmations on each page. (Damn, I should have taken a photo) Something that was very portable and can be carried in a handbag, referred to at anytime. Um, might have to look at that concept and do something for my writing mantras which seem to be growing all the time. (‘I have a unique voice’ – thanks, Karina). This week, I am starting another Margie Lawson course. This one is Empowering Characters Emotions and I’ve set up a homework loop for the RWAus members in the class. I’m really looking forward to it and will be working through Beyond Happily Ever After again. ‘Rewrite Edit Submit’ – it fits in with the mantra. And I’ve also bought a scrapbook to collage Beyond Happily Ever After and I’ve already started finding pictures, including my absolutely adorable Prince Henry. I love the collage, Di. My favourite bit, the $800k book auction money. I need to do a collage of my Regency and Medieval stuff. My desk is so blank, (did you see the photo of it on RWA blog?) Scary. Good luck with your edits, I hope an agent and contract is just around the corner for you.